This collection of butternut squash recipes showcases this wonderfully versatile ingredient. It is a remarkable star in soups, roasts, pasta, risotto, salads and even desserts, due to its sweet, rich flavour and its wonderful texture. Marcello Tully's spicy butternut squash soup will warm the cockles during the winter months, as will Dominic Chapman's brilliantly simple soup recipe. A popular ingredient in vegetarian recipes, Andrew McKenzie's uses it as the filling for his elegant squash and truffle ravioli. The richness of the squash also stands up well to many meats and fish, as with Galton Blackiston's pairings of roast cod with ratatouille and roast duck with squash mousse. 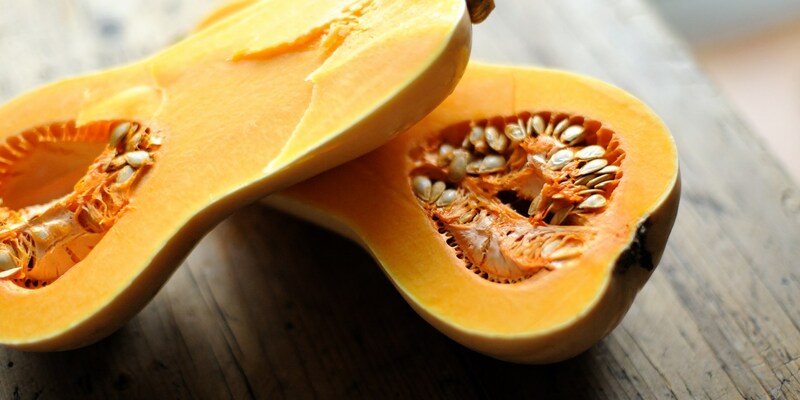 Silky and sweet, squash is an excellent addition to dessert recipes. Robert Thompson's bavarois of butternut squash is served with a refreshing quince sorbet, while Simon Hulstone's makes an ice cream to serve with his delicate rose and almond tansy pudding. Have a read of our article on how to cook butternut squash to ensure you get it right every time.